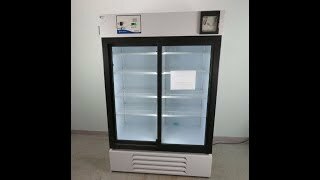 The Fisher Scientific Isotemp Dual Glass Door Refrigerator is a large capacity general purpose refrigerator with convenient glass doors for easy viewing of supplies and samples. This lab refrigerator has a temperature range of between 1 to 12°C with an average stability of ±3°C. Temperatures for this digital lab fridge can be set from the upfront brightly lit , 0.5 inch LED screen. The glass doors of this lab refrigerator are made from thermopane glass to help retain temperatures while providing maximum visibility, and glide easily to the side instead of swinging out, great for a high traffic or narrow space. The Fisher Scientific Isotemp Laboratory Refrigerator features a brightly lit interior, with a lightswitch in the upper control area, as well as a 6 in , seven day selectable temperature recorder. Alarms for this lab refrigerator can be set by the user to go off should there be a deviation from the set minimum and maximum temperature. This Fisher Isotemp Dual Glass Door Refrigerator 11670247 has been thoroughly inspected and comes with current temperature validation reports. All of our lab equipment comes backed with our standard warranty. Should you have any questions, please don't hesitate to contact us.